Coin collectors have long been fascinated by the great rarities of the numismatic world. Even if we can’t afford them, we love to learn about them, to look at them, to marvel over their fantastic stories. We’re inspired (often amazed, and sometimes shocked) by the adventures of the “super-collectors” like King Farouk of Egypt, a decadent monarch who drained his treasury to indulge his pastimes . . . the fabulously wealthy Colonel E.H.R. Green, who could afford any coin he wanted and once owned all five 1913 Liberty Head nickels . . . and Louis Eliasberg, the only collector ever to acquire one of every federally issued United States coin. Of course, we know that we’ll never be an Egyptian king, and few of us will ever attain the wealth of, for example, Chicago beer brewer Virgil Brand, who owned 350,000 coins (including more than two dozen $4 gold Stellas). But we can aspire to maybe, just maybe, be a John Jay Pittman—an “ordinary working man,” happily married for 60 years, a chemical engineer for Eastman Kodak Company in Rochester, New York, who had to collect coins on a regular budget. When Pittman’s collection was auctioned in the late 1990s, it went for more than $30 million. Here at Whitman Publishing headquarters we know thousands of hobbyists who got started collecting coins from their pocket change. In the 1940s you could still find Liberty Head nickels dating from the 1880s to the early 1900s in circulation. Buffalo nickels, minted from 1913 to 1938, continued to serve American commerce into the 1950s. Wheat cents became obsolete after 1958 (replaced by the Lincoln Memorial design in 1959) and entered the realm of coins to be picked out and set aside. Then in 1965 the alloy of most of the nation’s silver coins was changed to a copper-nickel composition. It didn’t take long for older silver dimes, quarters, and half dollars to completely disappear from circulation and go into collections and piggy banks. And in more recent years, hundreds of thousands of new collectors have joined the hobby by saving State quarters and other circulating coins. This simple style of collecting common-date coins at face value is the foundation for much of today’s hobby. Numismatics is no longer an elite “gentlemen’s club” reserved for the wealthy. Now it is a popular pastime, fueled by the quarters found in our pocket change, pursued by countless schoolchildren, waiters and waitresses, cashiers, computer techs, mechanics, farmers, college students, and other “ordinary” Americans. Rich or poor, every hobbyist needs to start somewhere. If we’re lucky, we do so with the guidance and mentoring of experienced collectors and teachers like Kenneth Bressett. Ken has been active in the hobby since the 1940s. He has worked continuously on the Guide Book of United States Coins (the annual retail and history guide known as the “Red Book”) for more than 60 years. He was officially recognized with the title of editor in 1974, taking the lead from the Red Book’s founder, R.S. Yeoman. Today Ken serves as senior editor and paterfamilias for the Red Book, the Blue Book, and the massive Mega Red, the 1,504-page Deluxe Edition Red Book. “Senior editor” is not an honorary title, but an active role that benefits greatly—and uniquely—from his constant study and exploration of American numismatics. 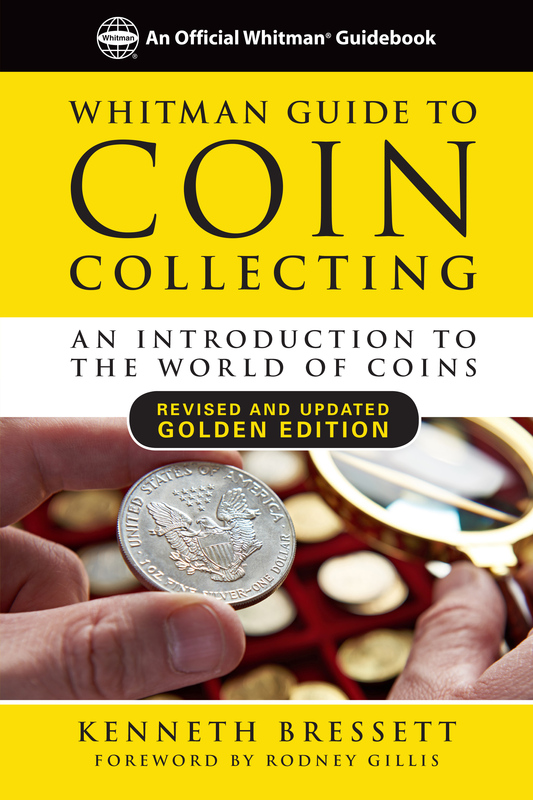 The Whitman Guide to Coin Collecting, first published in 1999, is one of Ken Bressett’s many contributions to the hobby. The book’s goal: to provide a much-needed gateway to numismatics, offering in a single volume everything new collectors need to get their feet on the ground. Not surprisingly, the “Yellow Book” (as it has come to be known) proved to be a popular beginner’s guide. It was updated and revised several times, including in a new edition in 2003. It has been a best-seller for nearly 20 years—an “evergreen,” as we say in the publishing world. We later published two companion books to give hobbyists a complete set of guides for every level of collecting. For intermediate collectors who want to continue expanding their knowledge there is Q. David Bowers’s Inside the Rare Coin Marketplace, and, for advanced students ready to fully immerse themselves, Bowers’s Expert’s Guide to Collecting and Investing in Rare Coins. The journey to expertise begins with the tried-and-true “Yellow Book.” The expanded Golden Edition, which will debut on the Fourth of July, 2017, has been updated with new information and guidance for today’s hobbyists, and upgraded to full color, with even more illustrations. Its readers will enjoy a one-on-one appointment with Ken Bressett, who opens the vault doors to his immense storehouse of practical, hands-on knowledge. It’s the perfect welcome to the world of coin collecting.